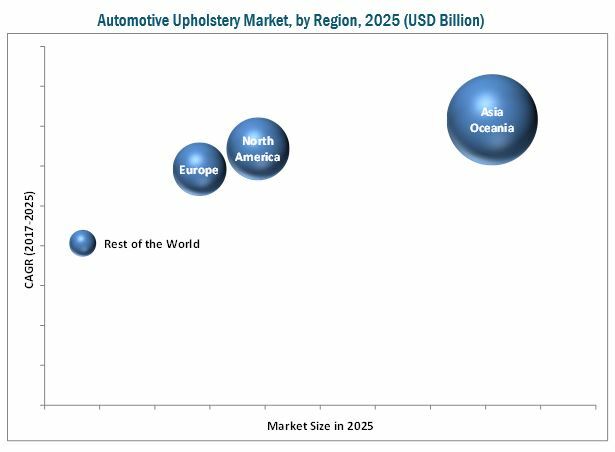 [139 Pages Report] The automotive upholstery market is estimated be USD 4.39 Billion in 2016 and is projected to grow at a CAGR of 6.59% during the forecast period, to reach USD 7.74 billion in 2025. The base year for the report is 2016 and the forecast period is 2017–2025. The market for automotive upholstery is primarily driven by the growing vehicle production, consumer demand for in-vehicle comfort and customized automotive interiors. Additionally, the automotive upholstery market is also influenced by the increasing level of driving automation and progress toward fully autonomous vehicles. The research methodology used in the report involves primary and secondary sources and follows bottom-up and top-down approaches for data triangulation. The study involves country-level OEM and model-wise analysis of automotive upholstery applications. This analysis involves historical trends as well as existing penetrations by country as well as vehicle type. The analysis is projected based on various factors such as growth trends in vehicle production and regulations or mandates on the usage of automotive interior upholstery materials. The analysis has been discussed and validated by primary respondents, which include experts from the automotive upholstery industry, manufacturers, and suppliers. Secondary sources include associations such as International Organization of Motor Vehicle Manufacturers (OICA), American Association of Motor Vehicle Administrators (AAMVA), Automotive Component Manufacturers Association of India (ACMA), and paid databases and directories such as Factiva and Bloomberg. The ecosystem of the automotive upholstery market consists of automotive interior application providers such as Lear Corporation (US), Adient PLC (Ireland), and Toyota Boshoku Corporation (Japan). These applications are supplied to automotive OEMs such as BMW Group (Germany), Daimler AG (Germany), Volkswagen AG (Germany), and others. The automotive upholstery market is estimated to be USD 4.65 Billion in 2017 and is projected to grow at a CAGR of 6.59% from 2017 to 2025, to reach a market size of USD 7.74 Billion by 2025. 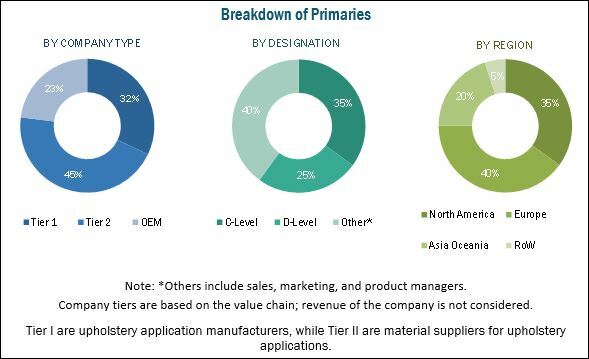 The key drivers for the market are the increasing demand for advanced automotive technologies and automotive interiors, rising focus on lightweight automotive materials, and the development of a varied non-fabric substitutes for automotive upholstery. The seat covers application is estimated to be the largest growing segment for the automotive upholstery market by automotive application, in terms of volume and value. The growth of this application can be attributed directly to the growth of vehicle production. Seat covers utilize the maximum upholstery material in an automotive application. Each car seat utilizes up to 2 meters of upholstery material. The upholstery material required for automotive seat covers varies depending on the vehicle model and vehicle type. The comfort of vehicle seats has become an important factor in influencing a purchase decision for a buyer who spends a significant amount of time in road transit. To cater to the growing demand for comfortable seats and seat covers from customers, automotive OEMs are providing customized seats. Today, customers can choose from a wide variety of seat covers, that are offered as a standard fit on car seats as well as diverse options in the aftermarket. Driver fatigue, which is observed as a major reason for vehicle accidents, can be reduced with ergonomically structured automotive seats and perforated seat covers. As a result, the coming decades will witness an increase in the uptake of advanced seat technologies such as sensor enabled seats, which monitor a driver’s biometrics and ventilated seats, which will subsequently drive the growth of the automotive seats upholstery market. The synthetic leather, upholstery materials type is estimated to be the largest segment of the automotive upholstery market. Synthetic leather offers key advantages over genuine leather. Apart from being more cost-effective, synthetic leather is also comparatively lightweight and easily washable. Genuine leather is processed and tanned for automotive interior applications. This process emits toxic waste which is hazardous for the environment. Synthetic leather is made of polyurethane and poly-vinyl chloride that are comparatively less harmful to the environment and can be recycled at the end of a vehicle’s life. Asia Oceania is expected to dominate the automotive upholstery market during the forecast period. The demand for automotive upholstery in this region is directly linked to the vehicle production in China and India, which are both automotive hubs. The demand for luxury vehicles in this region is anticipated to grow, which will further, drive the demand for automotive upholstery from this region. A key factor restraining the growth of the automotive upholstery market is the fluctuating price of upholstery raw materials. Automotive upholstery for interior applications is a combination of plastics, thermoplastic polymers, and synthetic leather. Polypropylene and polyester are commonly used across different automotive interior upholstery applications. However, the prices of these raw materials have seen an upward trend over the last year due to fluctuating crude oil prices. China is one of the world’s largest producer of polyester and controls the price of these commodities in the global market. Due to this, many raw material suppliers are entering the market to gain advantage of the low costs. China is home to many raw material suppliers and dominates the polymer and plastics market, which is a key raw material for automotive upholstery. The automotive upholstery market is dominated by a few global players and several regional players. Some of the key manufacturers operating in the market are Adient Plc (Ireland), Lear Corporation (US), and Toyota Boshoku (Japan). 12.6 Grupo Antolin Irausa, S.A.